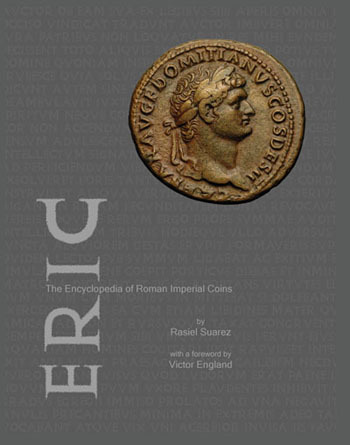 The Encyclopedia of Roman Imperial Coins (ERIC) is a compelling new book on Roman coins written by a collector for collectors. Among its main features, this work combines a comprehensive listing of bust and reverse types, legends and mints for all imperial rulers from the time of Augustus through the downfall of Rome as well as an introduction into the Byzantine corpus. ERIC also includes a full featured catalog listing major and minor issues for this time period listing a total of over 8,000 types. Color photographs, historical biographies and an introductory tutorial serve to make this the most user friendly book available on the subject. A copy may be ordered directly from Dirty Old Books for the list price of $75. Quantity discounts available. This entire book is now freely downloadable as zipped PDFs under a Creative Commons license.